How long has it been since you've had a delicious salad? I mean a really good one? The kinds of recipes we have today and what we think about salads in general has changed a great deal in the last 40-50 years. Pasta salads, potato salads, salads with vegetables and fruits, seafood salads, meat salads, Caesars, mixed wild green salads, dessert salads, gelatin salads ... the choices go on and on. It used to be a salad was something served just before an entree or sometimes with the entree. That salad was usually iceberg lettuce with French or Thousand Island dressing or oil and vinegar served in cruets. WOW! THINGS HAVE CHANGED! The “salad revolution” resulted in the development of dozens and dozens of customer-tested, customer-approved restaurant salad recipes. What flexibility this Almond Chicken Salad Recipe provides This restaurant recipe can be used to make a sandwich or a salad or by “tweaking” it just a little in creating a number of really great appetizers! Preparation time: 20 minutes. This recipe makes approximately 8 servings if used as a sandwich or a salad. For appetizers, much more. American cuisine is really a "melting pot" of world-wide recipes. 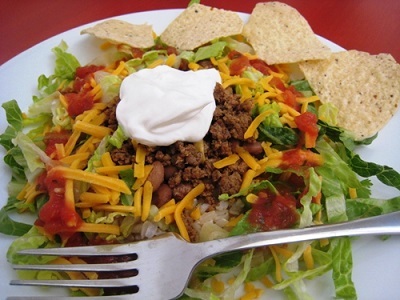 This beef taco restaurant salad is a huge seller. ENJOY! Preparation time: about 45 minutes. Serves 4-6. This restaurant recipe is for a tasty and beautiful Molded Cranberry Salad. This can make a great centerpiece for a large holiday family dinner if you use a mold. Otherwise you can cut the salad into individual portions. Preparation time: 20 minutes. Serves: 8-10. This quick and easy spinach and strawberry restaurant salad recipe will give you a lively, refreshing flavorful treat and the salad has great "eye appeal." 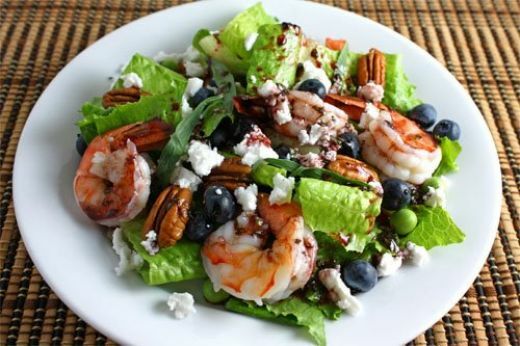 This salad always gets rave reviews from guests at home and at the restaurant. Preparation time: 15 minutes. Serves 8. 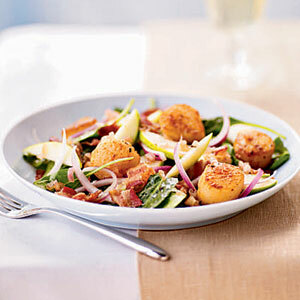 This seafood salad is a very special restaurant recipe that combines scallops in a warm spinach salad and calls for roasted red pepper vinaigrette that brings everything together for a real culinary treat. Preparation time: 30 minutes. Serves 4. You'll love this pear salad if you like blue cheese married with avocado and pear and enhanced with sugared walnuts. Preparation time: 15 minutes (after you have your sugared walnuts ready). Serves 4. Summer and Fall are perfect times for vegetables and grilling. 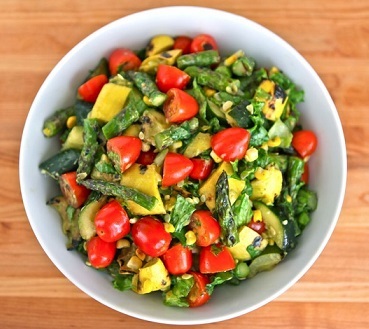 Combine the two: Grilled Vegetable Salad Recipe. Preparation time: 30 minutes. Serves 4-6, depending on portion. I serve this Cauliflower Salad when fresh cauliflower is readily available and when I am serving buffet style, at home or at the restaurant. It is easy, and very good. Preparation time: 25-30 minutes. Serves: 8-10. Preparation time: 45 minutes, but pasta salad should be chilled for at least one hour when finished. This restaurant pasta salad serves 6-8 people depending on portion desired. Nicely sliced, white mushrooms are really all you need for this spinach salad recipe but if you want to add some thin-sliced red onion and/or crisp bacon pieces, that's great, too. The restaurant salad dressing recipe used with this spinach salad is easy but it really pulls the entire salad together. Preparation time: 10 minutes. Serves 4-6 depending on portion desired. Cole Slaw - Best Ever! 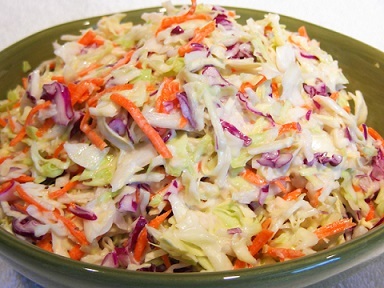 This Cole Slaw Recipe is one of the most popular salad recipes at the restaurant. Preparation time: 10 - 15 minutes. Serves 4. Enjoy! My goodness! Chick-Fil-A-Coleslaw-Recipe is no longer being made by the popular restaurant chain as of January 2016! But I have the original Chick-Fil-A Coleslaw Recipe for you to try at home. Now you have it, too. Preparation time: 15 minutes. Serves 6-8. Potato salad is an American tradition. There are entire cookbooks dedicated only to potato salad. 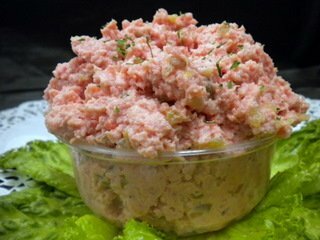 The potato salad restaurant recipe I provide is one of several favorites of my guests. Preparation time: 1 hour. 8-10 servings, depending on size of each. What makes this restaurant salad recipe somewhat unusual is that it requires a loaf of thick sliced white sandwich bread. I use canned or packaged wild salmon or wild, white, troll caught albacore tuna. Preparation time: 25 minutes, but must refrigerate over night. Serves 8.
Credit for the original Waldorf Salad I believe goes to the maître d'hôtel Oscar Tschirky of New York's Waldorf-Astoria Hotel in the 1896. Originally this salad contained only apples, celery and mayonnaise. The chopped walnuts were added later and this version has a twist or two that has proven successful with the restaurant patrons. Preparation time: about 25 minutes. Salad recipe serves 8-10. This Balsamic Vinaigrette Recipe creates my favorite dressing for almost any of the salads I prepare. I also use it to top fresh vegetables, especially garden fresh organic tomatoes, sliced thin. Then I top those and this dressing with freshly grated Parmesan cheese! Yummy! Preparation time: 5 minutes. Makes 1 cup. With the "explosion" of salad recipes came another flurry of restaurant recipes ...salad dressings. This Bleu Cheese salad dressing is so simple but so good many of the customers use sides of this salad dressing with their beef orders. Preparation time: 15 minutes. Serves approximately 15. This homemade French Salad Dressing Recipe is delicious and quick and easy. Preparation time: 20 minutes. 12-15 servings. Before the restaurant opened many years ago I was determined to develop the perfect Sweet Sour Salad Dressing to use as my House Dressing. Here it is! It's an award winner! Preparation time: 15 minutes. Makes 4-5 cups. You probably realize a vegetable-filled salad with a delicious low-fat dressing is an important part of a healthy diet. Thank you for your interest in real restaurant recipes and in cooking with confidence and style. 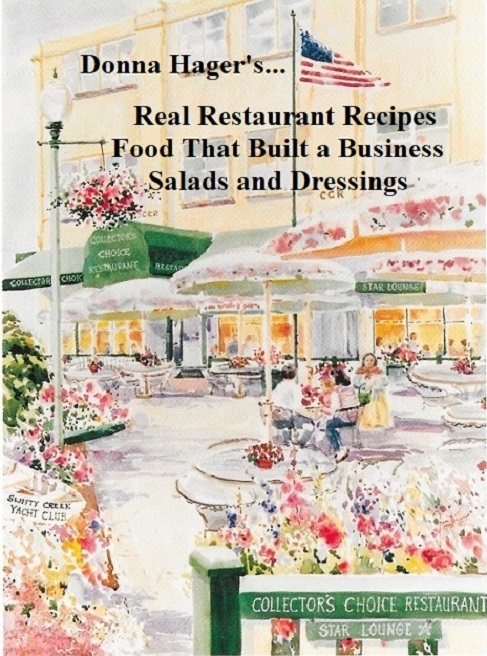 ENJOY your restaurant recipes for salads and the company of those you share them with! Come back often please. And, if you'd like these recipes as an e-book or you want a beautiful, full-color paperback, just click here or click the patio image.